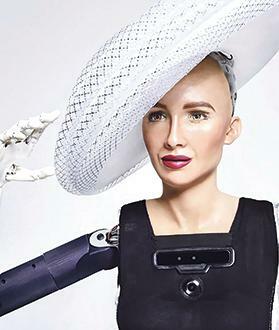 AI robot Sophia ‘headlined’ the annual Henley & Partners conference on the sale of citizenship held in Dubai this week, which Prime Minister Joseph Muscat had to miss due to other commitments. Dr Muscat was expected to deliver a keynote speech on how Malta made an economic success out of the sale of passports but had to change plans because of another engagement in China, according to a government spokesman. “The Prime Minster was engaged in high-level meetings in Shanghai, including with the President of China,” the spokesman said. Participants at the conference, mostly private agents, told Times of Malta they were surprised by Dr Muscat’s sudden change of plans, saying they were encouraged to travel to Dubai hoping to be introduced by the Prime Minister to new business contacts. “Still, we were glad that at least we were addressed by Sophia as she had just arrived from Malta and there was talk she would soon be given Maltese citizenship,” one of the participants said jokingly. Digital Economy Parliamentary Secretary Silvio Schembri told a press conference last week the government would consider granting citizenship to robots such as Sophia. He subsequently clarified he was not speaking about actual citizenship but “certain citizenship conditions” through a citizenship test for AI robots. Citizenship Parliamentary Secretary Julia Farrugia Portelli addressed the Dubai conference instead of Dr Muscat. Sophia, which was in Malta a few days ago to attend the first Blockchain summit to be held here, introduced a debate on the battle for digital supremacy.